In profile: Bioniks, a start-up that provides affordable, quality prosthetics to people in need of them. 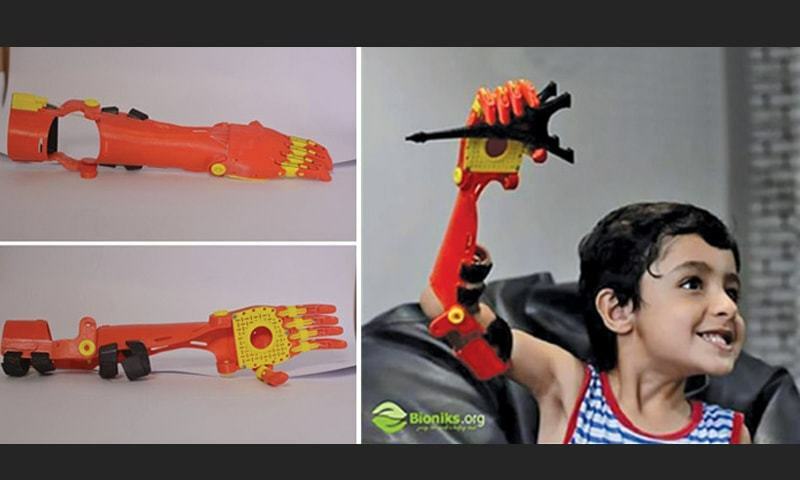 Mir Bayyan Baloch, a five-year-old boy with an arm deformity, became the first child in Pakistan to receive a specially-designed 3D printed mechanical (or manual) prosthetic. It began four years ago, when two mechatronics engineering students at SZABIST, Anas Niaz and Ovais Hussain Qureshi, were brainstorming possibilities for their final semester project. They noticed how disabled children tend to be ostracised – which led them to start a not-for-profit, 3D printing prosthetic company named Bioniks (bionic denotes artificial limbs or body parts that are electronically or mechanically powered). The company completed their first successful implant recently. In line with their vision of “giving the world a helping hand”, Bioniks began to work on prosthetic prototypes that were not only lightweight (200 grams for a child’s prosthetic arm compared to the 1,500 grams prosthetic available in the market), but also designed with superhero themes to appeal to their primary target audience: disabled children. In July 2016, Mir Bayyan Baloch, a five-year-old boy with an arm deformity, became the first child in Pakistan to receive a specially designed 3D printed mechanical (or manual) prosthetic. When Baloch’s father contacted Bioniks, little did he know that a boy who had become too introverted to even attend school because he was ‘different’, would turn into the popular ‘Iron Man’ boy, thanks to his mechanical arm that looks like a gadget from a sci-fi movie, and even shoots beams of light, just like his favourite superhero. “We could not give Baloch a motorised prosthetic because he is too young and his shoulder muscles are not strong enough to bear the weight.” However, Niaz and Qureshi have started working on developing a robotic arm for Baloch, which will be implanted as he grows up and becomes more adept at controlling and manoeuvring his mechanical one. Once the printing is complete, the prosthetic is implanted on the patient; Bioniks then provides post-implantation care in the form of ‘how to use’ training sessions by qualified medical professionals. The process begins with a face to face meeting to assess the extent of the patient’s muscle size and development. Next, their specially designed 3D printers (a product of Niaz and Qureshi’s engineering acumen) are fed a digitally scanned image of the prosthetic. This is followed by attaching coloured spools of cornstarch (procured from China) to the printer, which is the primary ingredient of the prosthetic. Once the printing is complete, the prosthetic is implanted on the patient; Bioniks then provides post-implantation care in the form of ‘how to use’ training sessions by qualified medical professionals. An important upgrade that Bioniks is looking to introduce is to connect the prosthetic surgically to the bone and develop neural connections which will allow recipients to move the artificial limb as easily as if it is naturally connected to their body. Bioniks is collaborating with Dr Dilshad Qureshi, a paediatrician working at the Children Hospital Quetta, for medical expertise in this regard. So far, most of the orders have come through word-of-mouth and referrals. Now to increase their reach, the Bioniks team are engaged in identifying potential PR platforms where their product can be highlighted. The idea behind Bioniks was to provide affordable, quality prosthetics to people in need of them without profit generation. However, there have been a few cases where the parents of disabled children insisted on paying for the implants, and those funds then went towards providing prosthetics for the underprivileged. Although they are proud of the international recognition their work has received – in December 2016, Forbes profiled Bioniks in an article titled 3D Printing Saving The World One Prosthetic At A Time – Niaz and Qureshi regret the fact that only a few people in Pakistan are aware of the work they are doing. For the moment, Bioniks do not have the funds to undertake any kind of marketing campaign as any funds they do manage to solicit go towards research and product development. They hope these constraints will be somewhat overcome as a result of a recent crowdfunding campaign they have launched on ZingoHub (a global crowdfunding platform) called ‘Real Life Superheroes’. Another option is looking for a brand sponsorship, but so far there have been no takers. The idea behind Bioniks was to provide affordable, quality prosthetics to people in need of them without profit generation. However, there have been a few cases where the parents of disabled children insisted on paying for the implants, and those funds then went towards providing prosthetics for the underprivileged. Bioniks is also reaching out to NGOs to help them with image building and resource mobilisation. According to Dr Bakht Sarwar, CEO of the Chal Foundation (an NGO), Sindh alone is estimated to have 450,000 people in need of a prosthetic. Another challenge is that the raw materials required for the printing process are not available locally, mainly because there is not enough demand for these materials to be produced in bulk, and it is not financially feasible to make them in small batches. Therefore, until the time mass production begins, Bioniks will have to import the raw materials from China. That time may not be very far off because other local start-ups have also forayed into the world of 3D printed prosthetic implants. Until the time mass production begins, Bioniks will import the raw materials from China. For Niaz and Qureshi, children with disabilities are their primary audience because as they grow up, they will need prosthetics with greater functionality and flexibility. Qureshi says Bioniks is working on seven ‘super-hero themed’ arms for children for which the sizing and designing stage has been completed. They aim to implant them by the end of this month.